2003 Spur Award Finalist - Click here to order. Late morning, a crier rode through the encampment to announce the news and the impending move. Mothers, small children, desiccated hags and decrepit old warriors, some of them in absurd reservation clothing, emerged from their lodges. Within minutes, the women had collapsed most of the lodges, and boys had gathered dozens of mules for loading. Warriors huddled in groups, talking and nodding grimly, while women and older children and gelded Mexican slaves hurried about with stacks of robes and cooking implements and lodge poles. The camp dogs howled and bustled about excitedly. An hour later, the Wanderers, four hundred strong, headed southwest toward the Red River. They formed a shifting column a half mile long, horses and mules and mongrel dogs, women riding mules and leading pack animals, mothers laden with infants constrained tightly on pack boards, boys driving the remuda – some eleven hundred horses – and naked children tied to their mounts and warriors ranging miles in advance. Lodge poles now formed heavily-loaded travois or made panniers, carrying baskets loaded with small children and puppies. The South Plains, 1873. Bison herds are dwindling on the Kansas prairie. Logan Fletcher, a young faith healer from Kentucky labors as a skinner on a buffalo hunting crew, waiting for the taming of the plains and the chance to spread the Word to the coming immigrants. On the reservation near Fort Sill, the U.S. government withholds food in retaliation for Comanche and Kiowa depredation in Texas. Cuts Something, an aging Comanche war chief, returns to his old home on the Pease River to revive his badger medicine. His quest is rewarded, and he leads his demoralized band back to the bison-rich Texas Panhandle. Logan’s crew abandons the Kansas bone field and heads into the Panhandle, where the brutal plains life erodes his idealism and raises questions he is ill prepared to answer. 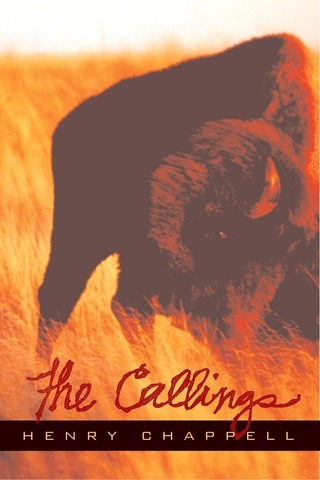 The inevitable confrontation of two men – each from an arrogant, expansionist culture – draws in an assortment of characters cast of the harsh land itself and just as gripping: Bob Durham, the former slave, whose skill as a plainsman saves Logan’s crew time and again; Ezra Higginbotham, the hunter whose determination to exploit the last of the southern bison herd imperils everyone around him; Elizabeth Keltner, the young woman who survives cholera and capture by Kiowas, then gives Logan reason to live; and Abraham, the giant Tonkawa scout who eats the flesh of his dead enemies and endures unspeakable torture to lead the army to Cuts Something’s band. The final clash tests the depths of Cuts Something’s resolve and compels Logan to confront the racism, brutality, and moral paradox of the American frontier in all its complexities. "The scenes could support a movie script, so closely are they detailed. Chappell may be at his best describing the warriors' horsemanship and the desolation that follows each attack...Those of us who have not yet become addicted to Western novels will be compelled to read more, though few will match the emotion and high quality of writing that converge in The Callings." "A fine adventure story of the West Texas frontier...Henry Chappell idealizes no imaginary nobility of either Native or Euro-Americans. Nor does he hedge on the darkness to which human nature can descend." "In his first novel, veteran Plano writer Henry Chappell spins a well-crafted tale that draws both from history and from his disciplined imagination." "The difference in Chappell's excellent historical novel is his skill in presenting the contrasting cultures of Indians, and the soldiers and hunters pre-ordained to win the contest." "Chappell's The Callings stands on its own as a serious literary treatment of a still underrepresented historical period. He represents West Texas with particularly compelling force and evocative language."